Gerrit Willem Dijsselhof (1866-1924) formed together with Theo Nieuwenhuis en Adolph Lion Cachet the forefront of the Dutch Art Nouveau movement. Although Dijsselhof has designed only a few bookbindings, he was also in this area an example for the others. 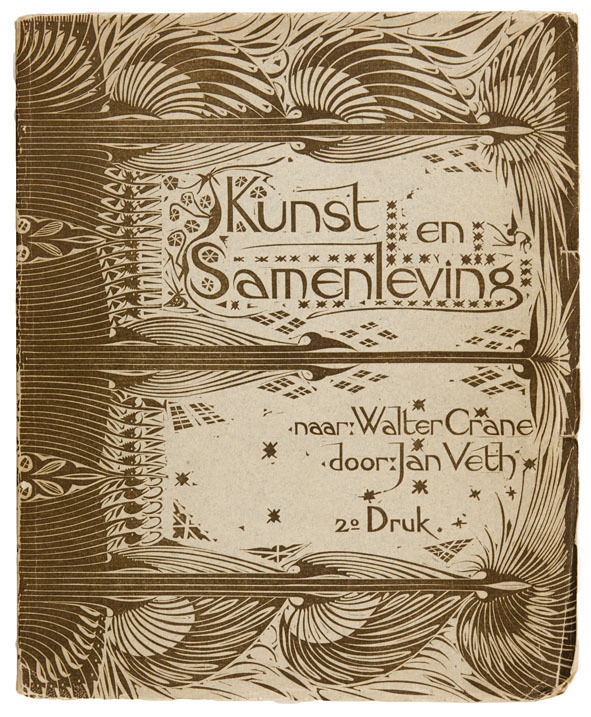 His most famous work is the book ornamentation for the Dutch translation of Walter Crane’s ‘The Claims of Decorative Art’, wich was published as ‘Kunst en Samenleving’ (Art and Society) in 1893. With this innovative work Dijsselhof set the standard for a new Dutch book design. One of his major innovations was that he expressed the materials and construction of the bookbinding in its design. He also reintroduced the woodcut in Dutch book art and made for each chapter a header and closing vignette. The motives for these small works of art are largely derived from the flora and fauna of the Dutch countryside and from Dutch folk art. For the endpapers Dijsselhof made a large woodcut of a flock of birds. The design is made with a mathematical design system. Golden lobsters represent the protective function of the bookbinding. On the back, against the spine of the book, the lobsters are less detailed. Woodcut with pelicans for the index page. Dijsselhof problably saw the example for these seahorses in Artis Zoo in Amsterdam. For the cover of the sewn edition Dijsselhof made a woodcut of stylized leaves. The brown color on and against the spine of the book symbolizes the material of the woodblock. The white lines in between represent the binding threads that hold the book together.